The vast literature of the American Old West evolved from dime novels of the late 1800s which portrayed life on the frontier as an idealized clash pitting virtuous cowboys and lawmen against "savage" Indians or outlaw gunfighters. 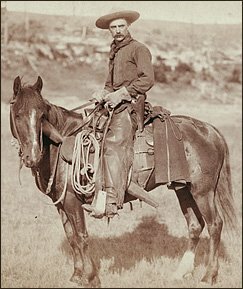 Classic "Westerns" by writers like Zane Grey and Louis L'Amour in the early to mid-twentieth century generally retained this romanticized approach, but most modern writers present a more realistic view of Western history. Native Americans have been portrayed with more sympathy in recent decades and, increasingly, as complex individuals who are neither vilified nor idealized. Native American authors have been among the most distinguished contributors to Western literature. Some of the most dramatic events in the history of the Old West included the 1849 California Gold Rush, the 1835 Texas Revolution, and the 1845 U.S-Mexican War which resulted in a broad swathe of the Southwest being transferred from Mexico to the U.S. Categories overlap, so if you don't find what you're looking for in one category, try another. The "Native Americans" section also includes novels about Indian wars and about European and African Americans who lived with various tribes. Clifton Adams, Tragg's Choice , a traditional Western; 1969 Spur Award winner. Clifton Adams, The Last Days of Wolf Garnett , about a man seeking vengeance on the outlaw who killed his wife; 1970 Spur Award winner. Tamera Alexander, Within My Heart (2009), historical romance about a young widow running a ranch in the Colorado Territory who must decide which of two men to marry; Christian message; currently available in audio format only. Amelia Bean, The Feud (1959), about a feud between cattlemen and sheepherders in Arizona. Amelia Bean, Time for Outrage (1967), about the “Lincoln County War” between some ranchers and a the owners of a general store in New Mexico; Billy the Kid appears as a minor character. Larry Bjornson, Wide Open (2012), about the son of a cattleman in Abilene, Kansas, a town roiling with conflict between ranchers and farmers in 1871 when Wild Bill Hickok is brought in to keep order. Margaret Brownley, Dawn Comes Early (2012), historical romance about a Boston woman in 1895 who writes dime novels and, when her latest novel is banned for immorality, goes to the Arizona Territory to take over a cattle ranch; Christian message. Emma Bull, Territory (2007), historical fantasy which imagines the shoot-out at the OK Corral as a battle between occult forces. Cliff Burns, The Last Hunt (2012), about an aging gunfighter who joins the hunt for a mountain lion terrorizing the Yellowstone National Park area in 1884; self-published. Terry W. Burns, Mysterious Ways , about a white con man and his travels with a black ex-slave with more education than he pretends to have; Christian message; #1 in the Mysterious Ways series. Terry W. Burns, Brother's Keeper , about a faithful Christian man searching for his outlaw twin brother in the Oklahoma territory; Christian message; #2 in the Mysterious Ways series. Terry W. Burns, Shepherd's Son , about a young rancher who must switch from cattle to sheep after his father dies, arousing violent opposition from the neighboring cattlemen; Christian message; #3 in the Mysterious Ways series. Katrina Carrasco, The Best Bad Things (2018), about a woman working for a smuggling ring in Washington State who disguises herself as a man to track down and recover a batch of stolen opium. Forrest Carter, The Outlaw Josey Wales (1976; also titled Gone to Texas), about a Confederate veteran who turns outlaw and flees to Texas. Forrest Carter, The Vengeance Trail of Josey Wales , sequel to The Outlaw Josey Wales. Walter van Tilburg Clark, The Ox-Bow Incident (1940), a literary novel about the lynching of three innocent men by a mob bent on vigilante justice in 1885. Thomas Cobb, Shavetail (2008), about a 17-year-old Connecticut boy serving in the U.S. Army in Arizona Territory when an Apache attack leads them to take on a near-suicidal mission. Victoria Dahl, The Wicked West (2009), explicit historical romance about a submissive English widow and a Wyoming sheriff. Duane DeMello, The Denton Mare (2008), about the Texas outlaw Sam Bass, from his horse racing exploits to his train robberies and the shoot-out in the town of Round Rock; self-published. Patrick deWitt, The Sisters Brothers (2011), a comic novel about two brothers hired in the 1850s to go to San Francisco to kill a man. Pete Dexter, Deadwood, about an aging Wild Bill Hickok who finds he cannot lay down his guns because of a host of vicious characters eager to challenge him. Marilyn Durham, The Man Who Loved Cat Dancing (1972), about an ex-convict who kidnaps a spirited woman running away from her husband in Wyoming. Thomas Eidson, St. Agnes' Stand, about a man on the run who saves a group of nuns from an Apache attack in the Old West; 1994 Spur Award winner. Loren D. Estleman, The Branch and the Scaffold (2008), a biographical novel about Judge Isaac Parker, the notorious "hanging judge" of the Old West. Loren D. Estleman, The Adventures of Johnny Vermillion (2006), about a man who arranges for one of the actors in his traveling theater troupe to rob the local bank while the others perform. Loren D. Estleman, The Undertaker's Wife (2005), about a retired undertaker and his wife at the turn of the twentieth century who recall their lives traveling about the West when he is asked to make a suicide's corpse look presentable; 2006 Spur Award winner. Loren D. Estleman, Black Powder, White Smoke (2002), about two killers, one black and one white, whose paths converge in Denver. Loren D. Estleman, The Master Executioner (2001), about a hangman in the Old West. Loren D. Estleman, The Rocky Mountain Moving Picture Association (1999), about a fledgling motion picture company in 1913 Los Angeles. Loren D. Estleman, Journey of the Dead (1998), about Pat Garrett (the man who killed Billy the Kid) and an ancient Spanish alchemist; 1999 Spur Award winner. Loren D. Estleman, Billy Gashade: An American Epic (1997), about a man who plays the piano in saloons and bawdy houses in the Old West. Loren D. Estleman, The Hider (1978), about the last buffalo hunter in the Old West. Loren D. Estleman, Sudden Country (1991), about a search for Confederate gold in the Black Hills of Dakota. Loren D. Estleman, Bloody Season (1988), about the gunfight at the O.K. Corral. Loren D. Estleman, Gun Man (1985), about an Iowa farm boy who becomes a gunfighter in the West. Loren D. Estleman, This Old Bill (1984), about Buffalo Bill Cody. Loren D. Estleman, Mister St. John (1983), about an aging hero who puts together a posse for one last manhunt. Loren D. Estleman, The Wolfer (1981), about two men hunting a wolf. Loren D. Estleman, Aces and Eights (1981), about Wild Bill Hickok. Loren D. Estleman, The High Rocks (1996), about a lawman's quest to stop a scalphunter from terrorizing Montana Indians; #1 in the Page Murdock series. Loren D. Estleman, Stamping Ground (1980), about a lawman's quest to capture a Cheyenne chief; #2 in the Page Murdock series. Loren D. Estleman, Murdock's Law (1982), about a lawman's quest to bring order to an Old West town; #3 in the Page Murdock series. Loren D. Estleman, The Stranglers (1984), about a lawman's quest to stop a band of outlaws who lynch peace officers; #4 in the Page Murdock series. Loren D. Estleman, City of Widows (1994), about a retired lawman running a saloon in New Mexico; #5 in the Page Murdock series. Loren D. Estleman, White Desert (2000), about a lawman pursuing a gang of criminals into Canada; #6 in the Page Murdock series. Loren D. Estleman, Port Hazard (2004), about a lawman from the American West on the Barbary Coast; #7 in the Page Murdock series. Loren D. Estleman, The Book of Murdock and Cape Hell (2010 and 2016), about a Deputy U.S. Marshal who poses as a minister to stay alive while tracking down the members of a gang terrorizing the Texas panhandle (The Book of Murdock) and who goes to Cape Hell, Mexico, to find out the truth behind a report that a former Confederate is raising an army to revive the American Civil War (Cape Hell); #8 and #12 in the Page Murdock series, in a 2017 edition containing both novels. Loren D. Estleman, Wild Justice (2018), about a Deputy U.S. Marshal who accompanies the body of a judge on his funeral train and reflects on what he has witnessed of the judge's thirty-year career; #13 in the Page Murdock series. K.R. Fitch, A Promising Man (2010), about a man whose failing stagecoach business has a fateful encounter with a band of outlaws; self-published. K.R. Fitch, Revenge (2010), about a former stagecoach operator whose new life as a rancher is threatened by men bent on revenge; sequel to A Promising Man; self-published. David Fuller, Sundance (2014), a novel which imagines that Harry Longbaugh - the Sundance Kid - does not die in the shootout in Bolivia, but survives to serve time in a Wyoming prison, is released in 1913 into a greatly changed world, and goes to New York City in search of his wife, Etta Place. Patricia Gaffney, Crooked Hearts (1994), historical romance about two con artists, a woman posing as a nun and a man pretending to be blind, who decide to team up after meeting on a stagecoach. Brian Garfield, Wild Times (1978), about the adventures of a gunslinger and Indian fighter; made into a TV miniseries starring Sam Elliott. Brian Garfield, Manifest Destiny , about the young Theodore Roosevelt's efforts to operate a ranch in the Dakota badlands in the 1880s. Molly Gloss, The Hearts of Horses (2007), about a nineteen-year-old girl who goes to work on an Oregon ranch in 1917. Zane Grey, Riders of the Purple Sage (1912), about a Mormon-hating cowboy and a young Mormon woman who fall chastely in love when he helps her defend her ranch; perhaps the best-known of Zane Grey's numerous (over 50) romanticized novels of the Old West. A.B. Guthrie, Jr., These Thousand Hills (1956), about a Montana cattle rancher who dreams of prosperity as both the natural world and human nature frustrate his intentions. Charles Hackenberry, Friends , about a sheriff and his deputy pursuing a killer across the Dakota Territory; 1993 Spur Award winner. Oakley Hall, Warlock (1958), about a gunfighter whose efforts to restore order as a newly minted lawman in a fictional Old West town ultimately lead to greater violence. Ron Hansen, Desperadoes, about the last surviving member of the Dalton Gang who revives his memories of old times writing adventure stories for Hollywood. Will Henry, I, Tom Horn (1975), a psychological portrait of an Indian fighter and rodeo rider who was capable of both compassion and cold-blooded murder. William W. Johnstone with J.A. Johnstone, Butch Cassidy: The Lost Years (2013), a novel which imagines what might have happened if Butch Cassidy had survived the 1908 shootout in Bolivia. Andrew Joyce, Redemption (2013), a Western novel which imagines Mark Twain's characters Huck Finn and Tom Sawyer as grown men, Huck a lawman and Tom a grieving widower; self-published. Anna Keesey, Little Century (2012), about an eighteen-year-old Chicago girl who migrates to Oregon as a homesteader after she is orphaned, and discovers herself in the middle of a range war. Elmer Kelton, Slaughter, about buffalo hunters in the Old West; 1992 Spur Award winner. Elmer Kelton, The Far Canyon (1994), about a rancher who tries to start over after the Battle of Adobe Walls in 1874; sequel to Slaughter; 1994 Spur Award winner. Ken Kesey and Ken Babbs, Last Go Round, about bronc busting at the Pendleton Round-Up in 1911. Gerald Kolpan, Etta (2009), a novel which imagines that Etta Place, the refined young woman who became the outlaw companion of Butch Cassidy and the Sundance Kid, began life as a banker's daughter in Philadelphia. Robert Knott, Robert B. Parker’s Ironhorse (2013), a Western which continues Robert B. Parker's "Cole and Hitch" series with a story about two U.S. marshals pursuing a gang of train robbers; #5 in the Cole and Hitch series (see listings below under Robert B. Parker). Robert Knott, Robert B. Parker’s Bull River (2014), about a lawman and his deputy who, after capturing a murderer and bringing him to the town where he is to be tried, are faced with another crime to investigate; #6 in the Cole and Hitch series (see listings below under Robert B. Parker). Al and Joanna Lacy, Outlaw Marshal (2009), about a federal marshal who persuades an outlaw to go straight and then tries to save him from hanging when a pair of train robbers frame him for murder; Christian message. Joe R. Lansdale, Paradise Sky (2015), about a former slave from post-Civil War Texas who must flee an irate white man, and his travels through the West. Melissa Lenhardt, Heresy (2018), about two women who turn outlaw and form an all-female gang after they are run off their farm by a greedy cattleman. Richard Liebmann-Smith, The James Boys: A Novel Account of Four Desperate Brothers (2008), a novel which imagines what might have happened if outlaws Frank and Jesse James had been been the younger brothers of philosopher William James and novelist Henry James. Richard Matheson, Journal of the Gun Years, a dark psychological study of a man was an outlaw and a lawman at various times; 1991 Spur Award winner. J.D. McCall, Four Horses Dead Ringer (2012), about a young man who served as an aging U.S. Marshal's deputy and in 1883, after envying his mentor's frontier experiences, is faced with a violent challenge. Cormac McCarthy, Blood Meridian: Or the Evening Redness in the West (1985), a literary novel about a teenaged boy who joins a group of Indian fighters who not-so-gradually evolve into a gang of murdering outlaws. Cormac McCarthy, The Crossing, a dark literary novel about a boy who captures a wolf and crosses into Mexico with it during the 1940s; #2 in the Border Trilogy. Cormac McCarthy, Cities of the Plains, a dark literary novel about two young ranch hands in 1952 New Mexico; #3 in the Border Trilogy. Kevin McCarthy, Wolves of Eden (2018), about two brothers, Irish immigrants, who after the Civil War enlist in the army to fight Indians. Michael McGarrity, Hard Country (2012), about a Texas rancher who goes to the New Mexico Territory in search of his brother's killer in 1875, where a job trailing cattle changes his life. Michael McGarrity, Backlands (2014), about a New Mexico family in the years after World War I, through the Depression and World War II; sequel to Hard Country. Larry McMurtry, Streets of Laredo (1993), about a bounty hunter and a Mexican bandit in the Old West; sequel to Lonesome Dove. Larry McMurtry, Dead Man’s Walk (1995), about two young Texas Rangers; prequel to Lonesome Dove. Larry McMurtry, Comanche Moon (1997), about conflicts between Indians and Texas Rangers; prequel to Lonesome Dove and sequel to Dead Man’s Walk; 1998 Spur Award winner. Larry McMurtry, Telegraph Days, about a woman who takes over a telegraph office in a small town in the Oklahoma Territory and becomes involved with many of the legendary gunfighters of the Old West. Larry McMurtry, Anything for Billy, about Billy the Kid. Larry McMurtry, Buffalo Girls , about Calamity Jane. Larry McMurtry, The Last Kind Words Saloon (2014), about the friendship of Wyatt Earp and Doc Holliday. Mark Mitten, Sipping Whiskey in a Shallow Grave (2012), about cowmen in 1887 Colorado, a gang of thieves, and the posse that's after them. Kerry Newcomb, The Ghosts of Elkhorn , about gunfighters in 1927 Colorado. Kerry Newcomb, Texas Anthem , about a Texan’s quest for vengeance after escaping from a Mexican prison; #1 in the Texas Anthem series. Kerry Newcomb, Texas Born , about a Texan’s quest for vengeance; #2 in the Texas Anthem series. Kerry Newcomb, Shadow Walker , about a teenaged bounty hunter in Texas; #3 in the Texas Anthem series. Kerry Newcomb, Rogue River , about a group of people trying to survive after a battle with the Cheyenne; #4 in the Texas Anthem series. Kerry Newcomb, Creed's Law , about a Texan in the Pacific Northwest; #5 in the Texas Anthem series. Robert B. Parker, Resolution (2008), about a pair of gunslingers who relocate in a newly built copper-mining town as conflict looms between the miners and the local ranchers; #2 in the Cole and Hitch series. Robert B. Parker, Brimstone (2009), about a pair of gunslingers in search of the woman one of them once loved, who ran off with another man; #3 in the Cole and Hitch series. Robert B. Parker, Blue-Eyed Devil (2010), about a pair of gunslingers in trouble after a crooked new sheriff arrives and a showdown looms; #4 in the Cole and Hitch series (see above for a continuation of the series by Robert Knott). Richard Parry, The Winter Wolf: Wyatt Earp in Alaska (1996), about Wyatt Earp's quest to strike it rich in the Alaska Gold Rush. Charles Portis, True Grit (1968), about a woman’s pursuit of the farmhand who murdered her father. Conrad Richter, Sea of Grass (1936), about conflicts between farmers and ranchers in late nineteenth century New Mexico. Mary Doria Russell, Epitaph (2015), about Doc Holliday and the 1881 shootout at the OK Corral; sequel to Doc. Jim Satterfield, The River's Song (2012), about a wrongly accused Civil War veteran hunted across the Missouri River Breaks in hostile Sioux territory by an obsessed vigilante. Jack Schaefer, Shane, about a former gunslinger who stays with a family in a small Montana town. Lauraine Snelling, Valley of Dreams (2011), about a young woman who works as a trick rider for her late father's Wild West show, which she discovers has been bankrupted by its manager; Christian message; #1 in the planned Wild West Wind series. Gary Svee, Sanctuary, about the conflicts that erupt when a traveling minister rides into a brutal Montana ranching town; 1990 Spur Award winner. Glendon Swarthout, The Shootist (1975), a gunfighter confronts Death personified in 1901 El Paso. Miles Swarthout, The Last Shootist (2014), a coming-of-age novel about an eighteen-year-old boy who thinks his killing of a famous gunfighter will bring him fame and glory; a sequel to The Shootist, the 1975 novel by Glendon Swarthout, the author's father. Guy Vanderhaeghe, The Englishman's Boy (1996), about a Hollywood producer in the 1920s who hires a screenwriter to find and tell the story of a bit player who is one of the last surviving Indian fighters; #1 in a trilogy. Guy Vanderhaeghe, The Last Crossing (2004), about two Englishmen searching for their brother, who has gone missing in Indian country somewhere in Canada or the U.S.; #2 in a trilogy. Guy Vanderhaeghe, A Good Man (2012), about a wealthy Canadian's son who tries to make it as a rancher in Montana, where he is not welcomed; #3 in a trilogy. John Vernon, Lucky Billy (2008), a gritty novel about the outlaw Billy the Kid. Anna Lee Waldo, Prairie: The Legend of Charles Burton Irwin and the Y6 Ranch (1986), a long, thoroughly researched novel about C.B. Irwin, who became a prominent rancher in Cheyenne, Wyoming, and was involved with such legendary Westerners as Buffalo Bill Cody, Will Rogers, painter Charlie Russell and outlaw Tom Horn; published both as a single volume and in two volumes. Jeannette Walls, Half Broke Horses (2009), about a woman who grew up on a New Mexico ranch, becomes a schoolteacher in Arizona at fifteen, moves to Chicago for a time, and then returns to the ranching life in Arizona; based on the life of the author's grandmother. Kaki Warner, Pieces of Sky (2010), historical romance about a pregnant Englishwoman who travels to the American West to make a new life for herself and meets a New Mexico rancher with a violent past; #1 in the Blood Rose trilogy. Kaki Warner, Open Country (2010), historical romance about a woman desperate to protect her sister's children who marries a man injured in a railroad disaster in order to claim the widow's settlement when he dies; #2 in the Blood Rose trilogy. Donald E. Westlake and Brian Garfield, Gangway! (1973), a comic novel about a small-time criminal who, after fleeing New York, comes up with a scheme to rob the U.S. mint in San Francisco. Richard S. Wheeler, Masterson, the aging ex-gunfighter Bat Masterson makes an impulsive trip west to revisit the legendary scenes of his former life; 2000 Spur Award winner. Victoria Wilcox, Inheritance (2013), about John Henry Holliday (later known as Doc Holliday), beginning with his boyhood in Georgia; #1 in the planned Southern Son series. Jeanne Williams, Home Mountain , historical romance about a young woman who moves her family to Texas after their parents die and struggles to make a living ranching; 1990 Spur Award winner. Owen Wister, The Virginian: A Horseman of the Plains (1902), about conflicts among cattlemen in 1890s Wyoming. Joe Yogerst, Nemesis: A Novel of Old California (2018), about a US marshal and a newspaper reporter, once best friends, now bitter enemies because of a woman, in the dangerous San Diego boomtown of the 1880s. Rosemary Agonito and Joseph Agonito, Buffalo Calf Road Woman (2005), a biographical novel about Buffalo Calf Road Woman, the only woman who fought Custer at the Battle of Little Bighorn; 2006 Western Heritage Award winner. Hervey Allen, The Forest and the Fort (1943), about an eighteenth century frontiersman kidnapped as a boy by the Shawnees;#1 in the Disinherited series. Hervey Allen, Bedford Village (1944), about an eighteenth century frontiersman kidnapped as a boy by the Shawnees; #2 in the Disinherited series. Hervey Allen, Toward the Morning (1948), about an eighteenth century frontiersman kidnapped as a boy by the Shawnees; #3 in the Disinherited series. Hervey Allen, City in the Dawn (1948), an omnibus edition containing all three novels in the Disinherited series. Piers Anthony, Tatham Mound, about a Native American storyteller's quest to save his people after Europeans invade North America. Elliott Arnold, Blood Brother, about the friendship between Cochise, chief of the Chiricahua Apaches, and the Indian agent Tom Jeffords. Catherine Bell, Rush of Shadows (2014), about two women, one white and one Native American, who become unlikely friends as tensions flare between the two cultures in nineteenth-century northern California. Thomas Berger, Little Big Man (1964), the humorous but unflinching tale of a white man raised by Indians in the Old West. Thomas Berger, The Return of Little Big Man (1999), sequel to Little Big Man. Irwin Blacker, Taos, about the Pueblo Revolt in northern New Mexico. Win Blevins, Stone Song, about the Sioux war chief Crazy Horse; 1995 Spur Award winner; 1996 Mountains and Plains Bookseller Award winner. Win Blevins, The Powder River , about the return of the Cheyenne from their reservation lands to their homeland on the Powder River, with the U.S. Army in pursuit. Win Blevins, Ravenshadow, a modern Lakota Sioux makes a pilgrimage to Wounded Knee and experiences a vision of the 1890 massacre of his people that took place there. Dee Alexander Brown, Creek Mary’s Blood, about a Creek Indian woman and her descendants. Forrest Carter, The Education of Little Tree (1976), the fictional “memoir” of a Cherokee man, actually written by the white segregationist Asa Earl Carter. Kelly and Tricia Cheek, All We Hold Dear (2013), about a present-day woman and a young Englishwoman whose diary describes her 1829 efforts to evade an organization that wants her silver artifact amid the conflicts leading to the Trail of Tears march. Alan Cheuse, To Catch the Lightning (2008), about Edward Curtis, who gave up his career as a studio photographer and left his wife and children to travel the West photographing Native Americans. Frederick J. Chiaventone, A Road We Do Not Know, an unromanticized novel about the Battle of the Little Bighorn. Frederick J. Chiaventone, Moon of Bitter Cold , about Red Cloud’s War; prequel to A Road We Do Not Know. Amanda Cockrell, When the Horses Came , about a buffalo hunter in prehistoric North America who has a magical dream of a horse; #1 in the Horse Catchers trilogy. Amanda Cockrell, Children of the Horse , about the descendants of the legendary "Horse Bringers" at the time Europeans settled in North America; #2 in the Horse Catchers trilogy. Amanda Cockrell, The Rain Child , about a Native American woman who raises an orphaned baby as her own child; #3 in the Horse Catchers trilogy. Will Levington Comfort, Apache (1931), a biographical novel about Mangas Colorados, a chief of the Chiricahua Apaches. Robert J. Conley, The Way of the Priests , about the Cherokee before the coming of Europeans to the American continent; #1 in the Real People series; first three novels in the series also available in one volume . Robert J. Conley, The Dark Way , about the Cherokee before the coming of Europeans to the American continent; #2 in the Real People series; first three novels in the series also available in one volume . Robert J. Conley, The White Path , about Sequoyah, the Cherokee leader who fought at the side of Andrew Jackson and developed a system for writing the Cherokee language; #3 in the Real People series; first three novels in the series also available in one volume . Robert J. Conley, The Way South, about a young Cherokee trader who tries to persuade the tribes south of his own to band together with his own against Spanish invaders; #4 in the Real People series. Robert J. Conley, The Long Way Home, about a priest forced to serve as the conquistador De Soto's interpreter, who tries to escape and warn the Cherokee of his coming; #5 in the Real People series. Robert J. Conley, The Dark Island, about the son of a Spaniard and a Cherokee who must decide whether to join the Spanish or help to defend the Cherokee; won the 1995 Spur Award for the Western Novel; #6 in the Real People series. Robert J. Conley, The War Trail North , a young Cherokee travels into Seneca country to avenge the death of his brother; #7 in the Real People series. Robert J. Conley, War Woman , about a Cherokee woman with part-Spanish blood who becomes a warrior; #8 in the Real People series. Robert J. Conley, The Peace Chief , about a young Cherokee man exiled from his people after he accidentally kills a friend; #9 in the Real People series. Robert J. Conley, Cherokee Dragon , about the great Cherokee war chief Dragging Canoe; #10 in the Real People series. Robert J. Conley, Spanish Jack (2001), about a Cherokee adventurer of the 1800s; #11 in the Real People series. Robert J. Conley, Geronimo: An American Legend , about the famous Apache warrior. Robert J. Conley, Mountain Windsong: A Novel of the Trail of Tears, about the forced removal of the Cherokees from their homeland to Oklahoma in the 1830s. Robert J. Conley, Ned Christie's War, an innocent Cherokee accused of murder becomes a warrior for justice. Robert J. Conley, Nickajack, about a murder trial in the years following the Trail of Tears march; 1992 Spur Award winner. Robert J. Conley, Zeke Proctor: Cherokee Outlaw , about a Cherokee veteran of the Civil War who turns outlaw. Robert J. Conley, The Long Trail North , about a half-Cherokee Texas rancher on the trail of the men who killed his partner. Robert J. Conley, Captain Dutch , about a Cherokee warrior whose Osage wife is murdered by her own people. Robert J. Conley, Incident at Buffalo Crossing , about conflicts between the Cherokee and white settlers drawn to a place known as Sacred Hill. Robert J. Conley, Medicine War , about a Cherokee shaman fighting a curse that has brought him into conflict with U.S. marshals. Robert J. Conley, Killing Time (1988), about a Cherokee sheriff who takes it personally when one of his prisoners is murdered in the jail. Robert J. Conley, Colfax (1989), about a gunfighter who sets out to avenge the murder of an honest man; sequel to Killing Time. Robert J. Conley, Quitting Time (1989), about a hired killer on the trail of some cattle rustlers. Robert J. Conley, Fugitive's Trail , about a boy who becomes an outlaw when he kills a man for shooting his dog; #1 in the Kid Parmlee series. Robert J. Conley, A Cold Hard Trail , Kid Parmlee is condemned to hang for a crime he didn't commit; #2 in the Kid Parmlee series. Robert J. Conley, The Devil's Trail , Kid Parmlee joins up with some lawmen hunting criminals; #3 in the Kid Parmlee series. Robert J. Conley, Barjack (2000), a humorous novel about a marshal in a small Old West town; #1 in the Barjack series. Robert J. Conley, Broke Loose (2000), a humorous novel about a marshal in a small Western town who enjoys trouble too much for his own good; #2 in the Barjack series. Robert J. Conley, No Need for a Gunfighter (2008), a humorous novel about a lawman who risks his life trying to hold onto his job after his town decides it has grown too respectable to have a gunfighter as their sheriff; #4 in the Barjack series. Robert J. Conley, Barjack and the Unwelcome Ghost (2009), a humorous novel about a marshal who must maintain order (and profits) when bank robbers ride into town with a vengeful Cherokee in hot pursuit; #5 in the Barjack series. Robert J. Conley, Strange Company , about a reluctant, part-Cherokee Confederate soldier and a Union prisoner of war who become unlikely allies after a sadistic officer forces them to fight each other to entertain his men. Robert J. Conley, Border Line , about a conflict over gold; sequel to Strange Company. Robert J. Conley, Go Ahead Rider (1990), a Harvard-educated Cherokee goes on the trail of a killer; #1 in the Rider series. Robert J. Conley, To Make a Killing (1994), a Harvard-educated Cherokee sheriff tangles with bootleggers; #2 in the Rider series. Robert J. Conley, Outside the Law (1995), a Harvard-educated Cherokee sheriff investigates the murder of a schoolteacher; #3 in the Rider series. Eric Flint, 1812: The Rivers of War, a novel of alternative history about what might have happened if the Cherokees had teamed up with African-Americans to create an independent nation in Arkansas. Eric Flint, The Arkansas War, a novel of alternative history about what might have happened if the Cherokees had teamed up with African-Americans to create an independent nation in Arkansas; sequel to 1812: The Rivers of War. Sharon Ewell Foster, Abraham’s Well (2006), about the black slaves of the Cherokee on the 1838 Trail of Tears. Charles Frazier, Thirteen Moons (2006), about a white man adopted by the Cherokee. W. Michael Gear, The Morning River (1996), a philosophy student turned riverboatman in 1825 falls in love with a Shoshoni medicine woman. W. Michael Gear, Coyote Summer (1997), about an educated white man and his search for the Shoshoni woman he loves, who has returned to her people to prepare them for the onslaught of white people about to move west; sequel to The Morning River. Cynthia Haseloff, The Chains of Sarai Stone , inspired by the story of Cynthia Ann Parker, a white woman raised by Indians. Cynthia Haseloff, Satanta's Woman: A Western Story , about a captive white woman’s life among the Kiowa. Cynthia Haseloff, The Kiowa Verdict, about a Kiowa war party put on trial in a Texas courtroom; 1998 Spur Award winner. Cynthia Haseloff, Man Without Medicine , about two Kiowa men searching for horses taken by white horse thieves. Joyce Henderson, To the Edge of the Stars, historical romance about a white woman in Texas who falls in love with a half-white, half-Comanche rancher. Joyce Henderson, Walks In Shadow , historical romance set in Texas about a woman rancher and a white man who was raised by Comanches. Joyce Henderson, Written on the Wind , historical romance about a white woman raised by Comanches and the Texas Ranger determined to "rescue" her. Will Henry, From Where the Sun Now Stands, about Chief Joseph and his 1877 trek to lead the Nez Perce from their reservation in Oregon to a new home 1,000 miles away in Montana. Ruth Beebe Hill, Hanta Yo (1979), about the Lakota/Dakota Indians before the coming of European settlers. Paul Horgan, A Distant Trumpet (1959), about an army officer on frontier duty in Arizona during the 1880s. Oliver La Farge, Laughing Boy, a love story about a young Navajo couple in 1915. Deborah Larsen, The White, about a sixteen-year-old white woman captured by Indians. K.B. Laugheed, The Spirit Keeper (2013), about the youngest girl in a family of Irish immigrants who is taken captive in 1747 at age seventeen by a young Indian man who has seen her in a vision. Alan LeMay, The Searchers (1954), about the violence between Indians and white settlers in the Old West and how it affected the survivors; the classic John Wayne movie was based on this novel. Joseph M. Marshall III, Hundred in the Hand, set in Wyoming, about the Battle of the Hundred in the Hand and the Fetterman Massacre from the point of view of the Lakota Indians. Gary McCarthy, River Thunder (2009 as an audio book; 2011 as a self-published paperback), about a Hualapai boy from the Grand Canyon's South Rim who is forced into a Indian school in 1902. Larry McMurtry and Diana Ossana, Zeke and Ned, about the last Cherokee warriors. Marjorie Mogonye, Flowers and Foxes, about a Choctaw family during the government's forced removal of the tribe from their Nanih Waya ancestral land in Mississipi to Oklahoma's Indian Territory. N. Scott Momaday, House Made of Dawn (1968), about a man from a Pueblo Indian reservation after the end of World War II; won a Pulitzer Prize in 1969; set during the author's lifetime, so not a true historical novel. N. Scott Momaday, The Way to Rainy Mountain (1969), about the author’s Kiowa ancestors from the myths of their origins in Montana to their relocation on an Oklahoma reservation. Vella Munn, Blackfeet Season (1999), about two Blackfeet half-brothers who vie for a woman's love and the honor of leading their tribe into battle. .
Vella Munn, Soul of the Sacred Earth, about a Catholic missionary to the Hopi. Vella Munn, Seminole Song , about Florida's Seminole Indians and their fight to remain on their ancestral lands. Vella Munn, Cheyenne Summer , about a Cheyenne tribe's struggle to survive after a fire destroys half their village. Vella Munn, The River's Daughter (1993), historical romance about an Indian woman and a white loner on the Oregon frontier. Vella Munn, Daughter of the Forest , about a conflict between two tribes in the Pacific Northwest after the coming of white settlers. Vella Munn, Wind Warrior, about the Chumash tribe of California and their conflicts with the Spanish. Vella Munn, Spirit of the Eagle (1996), about a Modoc woman who falls in love with a maverick Army officer on the California-Oregon border. Robert Murphy, Eagle Talons (2014), about a fourteen-year-old boy who travels West in 1867 and is given two eagle talons in thanks when he saves a Cheyenne boy's life. Kerry Newcomb, In the Season of the Sun, about two brothers, one an outlaw, the other raised by Indians. Kerry Newcomb, The Legend of Mickey Free , about an Apache who unwittingly betrays his people. Kerry Newcomb, Morning Star , about a veteran of the Civil War and his quest for vengeance after his Cheyenne wife is murdered. Kerry Newcomb, Sacred is the Wind, about a Cheyenne struggling to save his people. Kerry Newcomb, Scalpdancers , about a Blackfeet shaman and a sea captain in the Pacific Northwest. Kerry Newcomb, The Arrow Keeper's Song , about a Cheyenne who leaves his people to adopt a white way of life at the beginning of the 20th century. Conrad Richter, The Light in the Forest (1953), about a boy kidnapped as a small boy by Indians in Colonial Pennsylvania but returned to his original family eleven years later, having lost his memory of any life but his life with the Indians. Lucia St. Clair Robson, Ride the Wind, about Cynthia Ann Parker, who was adopted by a tribe of Apaches who kidnapped her when she was a child of nine. Lucia St. Clair Robson, Walk in My Soul, about Sam Houston and his Cherokee wife. Lucia St. Clair Robson, Ghost Warrior: Lozen of the Apaches, about an Apache woman in New Mexico. Lucia St. Clair Robson, Light a Distant Fire, about Osceola, the leader of the Seminole Indians in Florida. Dan Simmons, Black Hills (2010), about a young Sioux warrior who counts coup on the dying Custer at the Battle of the Little Bighorn and is haunted by Custer's spirit for the rest of his life. Tatjana Soli, The Removes (2018), about Libbie, the wife of General George Custer, and a teenage girl taken captive by the Cheyenne. Danielle Steel, Legacy (2010), a dual-time novel about a modern woman and her eighteenth-century Sioux ancestor who traveled to France and the court of Louis XVI and Marie Antoinette where she married a marquis. Michael Straight, Carrington: A Novel of the West (1959), about the Fetterman Massacre in 1866 Wyoming, in which a party of U.S. soldiers disobeying direct orders were ambushed by a group of Sioux. Michael Straight, A Very Small Remnant , about the Sand Creek Massacre. James Alexander Thom, Panther in the Sky (1990), a biographical novel about the Shawnee warrior Tecumseh. James Alexander Thom, The Children of First Man (1995), a novel which explores the possibility that the Mandan Indians may have been descendants of the Welsh Prince Madoc who, according to legend, sailed to America in medieval times. James Alexander Thom and Dark Rain Thom, Warrior Woman: the Exceptional Life Story of Nonhelema, Shawnee Indian Woman Chief (2003), about a woman chief of the Shawnee. Willard Thompson, Dream Helper: A Novel of Early California (2008), about a young Chumash Indian woman who is made a captive after she begs protection at a Franciscan mission. Greg Tobin, Prairie: An Epic of the West (1997), about the native people of the Great Plains before and after the coming of European settlers. William T. Vollman, The Dying Grass (2015), about General Oliver Otis Howard and the 1877 Nez Perce War. James Welch, The Heartsong of Charging Elk, a literary novel about an Oglala Sioux who travels with Buffalo Bill’s Wild West Show. James Welch, Fools Crow, about the coming-of-age of a young man of the Blackfeet tribe. David Marion Wilkinson, Oblivion’s Altar: A Novel of Courage, about the Cherokees and the Trail of Tears. Barbara Wood, Sacred Ground (2001), about a woman of the Topaa Indians and her descendants in southern California from prehistoric times to the present. Win Blevins, So Wild a Dream, about a mountain man in the 1820s Old West; 2004 Spur Award winner; #1 in the Rendezvous series. Win Blevins, Beauty for Ashes, about a mountain man in the 1820s Old West; #2 in the Rendezvous series. Win Blevins, Dancing with the Golden Bear , about a mountain man in the 1820s Old West; #3 in the Rendezvous series. Win Blevins, Heaven is a Long Way Off, about a mountain man in the 1820s Old West; #4 in the Rendezvous series. Win Blevins, A Long and Winding Road, about a mountain man searching for two Mexican girls kidnapped by Navajo raiders: #5 in the Rendezvous series. Win Blevins, Dreams Beneath Your Feet (2008), about a mountain man faced with finding a new way of making a living in 1840, as the fur trade comes to an end; #6 in the Rendezvous series. Win Blevins, Charbonneau: Man of Two Dreams (1975), a biographical novel about the son of Sacajawea, the Shoshone woman who translated for the Lewis and Clark expedition. Win Blevins, The Misadventures of Silk and Shakespeare , a humorous novel about a young trapper and his mentor, who used to be a Shakespearean actor. Win Blevins, The Snake River , about a mountain man in the Old West. Win Blevins, The Yellowstone , about a mountain man in the Old West. Peter Bowen, Yellowstone Kelly (1987), a humorous novel about scout Luther “Yellowstone” Kelly and his adventures after being hired as a guide for a group of Englishmen; #1 in the Yellowstone Kelly series. Peter Bowen, Kelly Blue (1991), a humorous novel about scout Luther “Yellowstone” Kelly; #2 in the Yellowstone Kelly series. Peter Bowen, Imperial Kelly (1992), a humorous novel about scout Luther “Yellowstone” Kelly; #3 in the Yellowstone Kelly series. Peter Bowen, Kelly and the Three-Toed Horse (2001), a humorous novel about scout Luther “Yellowstone” Kelly; #4 in the Yellowstone Kelly series. Ivan Doig, The Sea Runners (1982), about runaway Russian servants crossing the Pacific to the mouth of the Columbia River in Oregon Territory in 1853. Vardis Fisher, Pemmican: A Novel of the Hudson’s Bay Company (1956), about a young mountain man and a white girl raised by Indians. Vardis Fisher, Tale of Valor (1958), about the Lewis and Clark Expedition. Vardis Fisher, Mountain Man, a story about an Old West mountain man that inspired the movie Jeremiah Jones. Sandra Garcia, The Journey to Horse Creek (2012), about the daughter of a trapper, who must travel from Oregon to a rendezvous in Wyoming to find a husband after her father dies; self-published. A.B. Guthrie, Jr., The Big Sky (1947), about explorers and trappers in the Old West. Brian Hall, I Should Be Extremely Happy in Your Company (2003), about the Lewis and Clark Expedition; 2004 Spur Award winner. Terry C. Johnston, Carry the Wind, about a young man running away from St. Louis who is taken in by a mountain man who helps him survive a winter in the Rocky Mountains. Lotus Landry, Skookum Man (2009), about a girl brought up in the fur-trapping country along the Columbia River and an officer newly arrived at the fort; self-published; available in digital form only. Frederick Manfred, Lord Grizzly (1954), about a man whose life changes after he is left for dead following an attack by a grizzly bear. Gary McCarthy, Grand Canyon Thunder (2011; originally published 1996 as Grand Canyon), about William Dunn, who leaves the doomed Powell Expedition of 1869 and tries to makes his way out of the Grand Canyon. Gary McCarthy, Yosemite Thunder (2011; originally published 1995 as Yosemite), about the Yosemite area during the nineteenth century before it became a National Park. D.M. McGowan, Partners (2008), about a loner mourning the loss of his family in a cholera epidemic who begins traveling the Canadian West with a younger man he considers a tenderfoot; self-published. Vella Munn, Daughter of the Mountain, a love story about a woman in the Donner Party who is rescued by a mountain man. Stef Penney, The Tenderness of Wolves, about the Northern Territory and the Hudson Bay Company. Irving Stone, Immortal Wife (1944), a biographical novel about Jessie Ann Benton Fremont, the wife of explorer John C. Fremont. Irving Stone, Men to Match My Mountains (1956), about the opening of the American West. Richard S. Wheeler, Sun River (1989), about a mountain man who reluctantly agrees to lead a group of missionaries through Crow and Cheyenne territory to reach the Blackfoot Nation; #1 in the Skye's West series. Richard S. Wheeler, Bannack (1989), about a mountain man; #2 in the Skye's West series. Richard S. Wheeler, The Far Tribes (1990), about a mountain man's efforts to rescue a Massachusetts man from a hostile tribe after he sets out to study Indian ways; #3 in the Skye's West series. Richard S. Wheeler, Yellowstone (1990), about a mountain man who leads a wagon train through the Great Plains; #4 in the Skye's West series. Richard S. Wheeler, Bitterroot (1991), about a mountain man who agrees to guide a Quaker missionary into Montana's Bitterroot Valley; #5 in the Skye's West series. Richard S. Wheeler, Sundance (1992), about a mountain man trying to rescue a girl lost in hostile Sioux country; #6 in the Skye's West series. Richard S. Wheeler, Wind River (1993), about a mountain man who takes a job as a scout and translator for the U.S. Department of Indian Affairs and finds his loyalties divided; #7 in the Skye's West series. Richard S. Wheeler, Santa Fe (1994), about a mountain man hired to guide a traveling medicine show along the Santa Fe Trail; #8 in the Skye's West series. Richard S. Wheeler, Rendezvous (1997), a prequel about Skye's 1826 transformation from a Royal Navy deserter to a mountain man; #9 in the Skye's West series. Richard S. Wheeler, Dark Passage (1998), about a mountain man in 1830 who is captured by a hostile Blackfeet tribe after he loses his wife to another mountain man; #10 in the Skye's West series. Richard S. Wheeler, Going Home (2000), about a mountain man who has an opportunity in 1832 to clear his name and return to his former home in England; #11 in the Skye's West series. Richard S. Wheeler, Downriver (2001), about a mountain man who goes to St. Louis in 1838 to find a job after he learns the beaver are dying out; #12 in the Skye's West series. Richard S. Wheeler, The Deliverance (2003), about a mountain man and his Crow Indian wife who agree to help a Cheyenne woman find her children, kidnapped by the Utes; #13 in the Skye's West series. Richard S. Wheeler, The Fire Arrow (2007), about a mountain man trying to bring his wounded Crow wife home to her people during a harsh winter; #14 in the Skye's West series. Richard S. Wheeler, The Canyon of Bones (2008), about a mountain man who guides an English tabloid writer through the Yellowstone and Missouri country; #15 in the Skye's West series. Richard S. Wheeler, Virgin River (2008), about a mountain man guiding a group of young tuberculosis patients across Utah; #16 in the Skye's West series. Richard S. Wheeler, North Star (2009), about an aging mountain man with two Indian wives who faces new dangers from cattlemen and corrupt Indian agents as the wilderness that was his home disappears; #17 in the Skye's West series. Richard S. Wheeler, The Owl Hunt (2010), about the schoolteacher son of a mountain man and a Shoshone woman who becomes caught up in government violence after one of his students has a vision of a future in which Shoshone life returns to the way it was before the coming of the white man; #18 in the Skye's West series. Richard S. Wheeler, The First Dance (2011), about the son of a mountain man and a Shoshone woman whose work as a translator for the U.S. army in 1885 threatens his marriage to a Metis woman; #19 in the Skye's West series. Stewart Edward White, The Long Rifle , about Daniel Boone. James Alexander Thom, From Sea to Shining Sea (1986), about the parents and family of Merriwether Clark and Clark's experiences in the Lewis and Clark Expedition. James Alexander Thom, Sign Talker (2001), about George Drouillard, who accompanied the Lewis and Clark Expedition as their translator for Indian tribes they met along the way. Anna Lee Waldo, Sacajawea, about the Shoshoni woman who accompanied the Lewis and Clark expedition. Norman Zollinger, Meridian (1997), about frontier explorers Kit Carson and John Charles Frémont. Judy Alter, Mattie (1988), about the first woman doctor in Nebraska; 1988 Spur Award winner. Ivan J. Barrett, Eph Hanks: Fearless Mormon scout (1990), a biographical novel about a Mormon pioneer who traveled west with Brigham Young but left the main group to go on to California with the Mormon Battalion of the U.S. Army, and later served as a Pony Express rider. Amelia Bean, The Fancher Train (1957), about the Mountain Meadows Massacre, the killing of the settlers in a wagon train traveling through southern Utah. Win Blevins, The Rock Child, set in Mormon country in 1862 and featuring a mix of historical characters like Sir Richard Francis Burton and such unlikely fictional characters as a Tibetan nun forced into prostitution in the Old West. Lana McGraw Boldt, Fionna's Will (1987), a family saga about a Virginia woman who escapes to Oregon Territory when her work with the Underground Railroad endangers her life, the two men who enter her life on the Oregon Trail, and her descendants. Maggie Brendan, No Place for a Lady (2009), about a Southern belle who visits her aunt's Colorado ranch in 1892 and falls in love with a cowboy; Christian message; #1 in the Heart of the West series. Maggie Brendan, The Jewel of His Heart (2009), about a young woman in 1890s Montana who falls in love with a sheepherder; Christian message; #2 in the Heart of the West series. Maggie Brendan, A Love of Her Own (2010), historical romance about a woman who visits her brother in an unpromising Montana mining town and falls in love with a horse trainer; Christian message; #3 in the Heart of the West series. Maggie Brendan, Deeply Devoted (2011), historical romance about a mail-order bride from Holland who marries a Wyoming man with a mother who tries to undermine their marriage; Christian message; #1 in the planned Blue Willow Brides series. Sigmund Brouwer, Pony Express Christmas (2000), a novella about a Chicago family that has recently settled on the frontier, and the Christmas Eve encounter of the father and son with a Pony Express rider in the midst of a blizzard. Harry Castlemon, The Pony Express Rider (1898), about a Pony Express rider. Megan Chance, Bone River (2012), about a woman in Washington Territory who learns her much-older husband has kept secrets from her after she discovers a mummy in a riverbank. Kae Cheatham, Hammer Come Down: Memoirs of a Freedman (2012), about a slave who travels west with his master in 1836 after his master's plantation is destroyed during the Creek Indian War; self-published. Kae Cheatham, On Promised Land (2012), about a free black man, his younger siblings, and his Seminole wife who travel west from the Everglades in the 1840s after the Second Seminole War; self-published. Susan Cokal, Breath and Bones, about a highly sexed Danish orphan who follows her lover to America and travels through the Old West searching for him. Dane Coolidge, Riders of Deseret (1925), about a U.S. army officer assigned in 1877 to go into Mormon territory, which the Mormons believe is not subject to U.S. law, to investigate a massacre that occurred twenty years previously. Sandra Dallas, True Sisters (2012), about four women in very different family circumstances who are Mormon converts and set out on the journey from Iowa to Salt Lake City in 1856. Sandra Dallas, The Patchwork Bride (2018), about a Kansas woman who travels to the New Mexico Territory in in 1898 in order to look for a husband, and the present-day woman who tells the story to her granddaughter, a bride-to-be who is thinking of calling off her wedding. H.L. Davis, Honey in the Horn (1935), a Pulitzer Prize-winning novel about settlers on the Oregon frontier in the early twentieth century. T.M. Dolan, Guns of the Pony Express (1995), a Western about a Pony Express rider attracted to his boss's Indian girlfriend. David Anthony Durham, Gabriel's Story (2001), a coming-of-age story about a black teen in the 1870s who, angry about being forced to move west to Kansas with his family to become homesteaders, joins a wagon train led by a brutal outlaw. Edward S. Ellis, Alden the Pony Express Rider; or, Racing for Life (1909), a "dime novel" adventure story about a Pony Express rider. Edward S. Ellis, Alden Among the Indians: Search for the Missing Pony Express Rider (1909), a "dime novel" adventure story about a Pony Express rider; sequel to Alden the Pony Express Rider. Jonathan Evison, West of Here (2011), about a fictional town on the Washington coast in 1890 and the present day, focusing on the residents' relationships with the land and a nearby Indian tribe. David Farland, In the Company of Angels (2009), about the Willie Handcart Company of 1856, a group of Mormons who traveled from Liverpool, England, to Salt Lake City, Utah, enduring a deadly Wyoming blizzard on their way. Edna Ferber, Cimarron (1929), about a Kansas family who migrate to Oklahoma as part of the Oklahoma Land Rush. Vardis Fisher, Toilers of the Hills (1927), about a struggling farmer and his wife in Idaho. Vardis Fisher, Dark Bridwell (1930, also titled The Wild Ones , a sequel to Toilers of the Hills. Vardis Fisher, Children of God (1939), about the Mormons. Vardis Fisher, City of Illusion (1941), about an ambitious woman in Virginia City, Nevada, during the silver mining era of the 1860s. Vardis Fisher, The Mothers (1943), about the Donner Party. Karen Joy Fowler, Sarah Canary (1991), about a Chinese railway worker and an Anglo-American woman in the Pacific Northwest. Judith Freeman, Red Water (2002), a literary novel about the 1837 Mountain Meadows Massacre, as experienced by three of the nineteen wives of John D. Lee, the Mormon settler accused of the massacre twenty years later. Brenda Marshall, Dakota: Or What's a Heaven For (2010), about women in the Dakota Territory in the late nineteenth century. Kathleen O'Neal Gear, Sand in the Wind (1990), about white homesteaders and the Cheyenne in Montana. Kathleen O'Neal Gear, Thin Moon and Cold Mist (1995), about a woman trying to work a gold mining claim in Colorado after the Civil War. Leo V. Gordon and Richard Vetterli, Powderkeg , about an 1857 U.S. military expedition against the Mormons in Utah Territory. A.B. Guthrie, Jr., The Way West (1949), about a wagon train traveling west in 1846; won the Pulitzer Prize in fiction in 1950; sequel to The Big Sky. A.B. Guthrie, Jr., Fair Land, Fair Land (1982), about an old frontiersman turned conservationist. Anne Hawkins, To the Swift (1949), about the Pony Express. Celia Hayes, To Truckee's Trail (2007), a novel in the form of a diary about the Stephens-Townsend Party, the first to travel to California by wagon train across the Sierra Nevada Mountains, two years before the Donner Party met disaster on the same trail; self-published. Cecelia Holland, An Ordinary Woman: A Dramatized Biography of Nancy Kelsey (1999), about a pioneer woman who makes the overland journey to California. Stef Ann Holm, Crossings (1995), historical romance about a woman struggling to keep a general store and Pony Express station operating after her father is murdered. James D. Houston, Snow Mountain Passage (2001), about a family who traveled West with the Donner Party. Michael S. Katz, Shalom on the Range (2007), about a Jewish railroad detective investigating a train robbery in 1870 Colorado. Jane Kirkpatrick, A Clearing in the Wild (2006), about a German-American woman in a Bethelite religious colony in 1850s Missouri who takes the opportunity to push for freedom when she joins a group sent to the Northwest to scout a new location for the group; Christian message; #1 in the Change and Cherish trilogy. Jane Kirkpatrick, A Tendering in the Storm (2007), about a German-American woman and her husband who break away from a confining religious community to make their own way in 1850s Washington territory; Christian message; #2 in the Change and Cherish trilogy. Jane Kirkpatrick, A Mending at the Edge (2008), about a German-American woman struggling to balance her need for community and individual freedom in a confining religious community in 1850s Oregon; Christian message; #3 in the Change and Cherish trilogy. Jane Kirkpatrick, All Together in One Place (2000), about a group of women on the Oregon Trail in 1852; Christian message; #1 in the Kinship and Courage trilogy. Jane Kirkpatrick, No Eye Can See (2001), about a blind widow who settles in California after surviving tragedy on the Oregon Trail; Christian message; #2 in the Kinship and Courage trilogy. Jane Kirkpatrick, What Once We Loved (2001), about a group of women struggling to make new lives for themselves in California and Oregon after surviving tragedy on the Oregon Trail; Christian message; #3 in the Kinship and Courage trilogy. Brian Leung, Take Me Home (2010), about a woman who, after her brother's Wyoming farm fails, must work in a mine, where she becomes friends with a Chinese miner, setting off the fury of their violently prejudiced town. Greg Lilly, Under a Copper Moon (2007), about a mail-order bride in the Arizona Territory copper-mining town of Jerome in 1894. Phillip Margolin, Worthy Brown’s Daughter (2014), about a bereaved frontier lawyer in Oregon who represents a slave whose master has backed out of a promise to free him and his daughter, unleashing a violent moral dilemma. Norah Lofts, The Road to Revelation (1941; also titled Winter Harvest ), about the Donner Party. D.M. McGowan, Homesteader: Finding Sharon (2009), about a homesteader in the Canadian West of the 1880s who takes a stand against a cattle company while falling in love with a woman who runs a bordello; self-published. Larry McMurtry, Boone’s Lick (2000), about a woman who travels west with her fifteen-year-old son and her younger children to find her husband and tell him she's leaving him. Larry McMurtry, Sin Killer (2002), about an aristocratic English family on a misguided trip through the Old West; #1 in the Berrybender series. Larry McMurtry, The Wandering Hill (2003), about an aristocratic English family on a misguided trip through the Old West; #2 in the Berrybender series. Kelly O'Connor McNees, In Need of a Good Wife (2012), about a woman who starts a business matching mail-order brides with husbands in Nebraska, and two women she brings West with her. Hugh Nissenson, The Tree of Life (1985), about a minister who has lost his faith and who moves west to Ohio. Tristi Pinkston, Season of Sacrifice, about a Welsh immigrant who joins the Mormon migration to Utah; Christian message. Allison K. Pittman, With Endless Sight (2008), about a fourteen-year-old girl who loses her family on the Oregon Trail and must depend on her faith in God to sustain her through the harsh trials that follow; Christian message. Clay Reynolds, Tentmaker (2002), about a St. Louis tentmaker who travels west in the 1880s, where his wagon breaks down in the middle of nowhere and a tent community gradually grows on the site. Conrad Richter, The Fields (1946), about a woman from a backwoods family in Ohio who marries an educated man from New England as Ohio transforms from woodland to farmland; #2 in the Awakening Land trilogy. Conrad Richter, The Town (1950), about an Ohio woman who experiences the transition of the country around her from farms into a town; #3 in the Awakening Land trilogy. Ole E. Rolvaag, Giants in the Earth (first published in English, 1927), about Norwegian immigrants pioneering on the Dakota plains; a classic but technically not a historical novel since it was based on Rolvaag’s own experiences. Dana Fuller Ross, Independence! (1978), about a man who leads a wagon train from Independence, Missouri, to the Oregon Territory in 1837; #1 in the Wagons West series; Dana Fuller Ross is a pen name of Noel B. Gerson. Dana Fuller Ross, Nebraska (1979), about a man leading a wagon train through Nebraska on its way to the Oregon Territory in the autumn of 1837; #2 in the Wagons West series; Dana Fuller Ross is a pen name of Noel B. Gerson. Dana Fuller Ross, Wyoming (1979), about a man leading a wagon train across the Great Plains to the foothills of the Rocky Mountains on its way to the Oregon Territory in 1838; #3 in the Wagons West series; Dana Fuller Ross is a pen name of Noel B. Gerson. Dana Fuller Ross, Oregon! (1979), about a man who leads the first wagon train into the Oregon Territory; #4 in the Wagons West series; Dana Fuller Ross is a pen name of Noel B. Gerson. Dana Fuller Ross, Texas! (1980), about a group of Oregon Trail pioneers who travel to Texas and fight in the Texas Revolution and the Mexican War as they strive to bring their state into the Union; #5 in the Wagons West series; Dana Fuller Ross is a pseudonym used by Noel B. Gerson. Dana Fuller Ross, California! (1980), about a group of California settlers and the challenges they face during the 1848 Gold Rush; #6 in the Wagons West series; Dana Fuller Ross is a pseudonym used by Noel B. Gerson. Dana Fuller Ross, Colorado! (1981), about a group of Colorado settlers during the Pike's Peak Gold Rush which, beginning in 1858, brings 100,000 new settlers to Colorado; #7 in the Wagons West series; Dana Fuller Ross is a pseudonym used by Noel B. Gerson. Dana Fuller Ross, Nevada! (1982), about a Union general enlisted to guard a shipment of silver from Nevada's Comstock Lode to protect it from Confederate troops and their British allies; #8 in the Wagons West series; Dana Fuller Ross is a pseudonym used by Noel B. Gerson. Dana Fuller Ross, Washington! (1982), about a Civil War veteran who travels to the Washington Territory where he will help to survey the route for the northern transcontinental railroad; #9 in the Wagons West series; Dana Fuller Ross is a pseudonym of Noel B. Gerson. Jory Sherman, The Medicine Horn (1991), about a young married couple who migrate west to Kentucky; 1991 Spur Award winner; #1 in the Buckskinners series. Jory Sherman, Trapper's Moon (1994), about a man and his son struggling to make a living as trappers; #2 in the Buckskinners series. Tonya Holmes Shook, The Drifters (2004), a fictionalized biography of one of the author's ancestors, one of the Melungeon Shantyboat People, who traveled west from Kentucky and was involved in the Trail of Tears, the Civil War and Texas cattle drives; Christian message; self-published. Tonya Holmes Shook, Canady: The Lost Shantyboat Man (2009), sequel to The Drifters; Christian message; self-published. Annette Snyder, Travis Pass (2005), historical romance about young people from two families in conflict as both move west as part of the Oklahoma Free Land Race; self-published. Annette Snyder, Sally Murphy (2005), historical romance about a New York orphan sent west by train and adopted by a preacher; self-published. Annette Snyder, Liberty Road (2005), historical romance about a heartbroken young woman and the owner of a saloon and brothel. Annette Snyder, Rock Creek (2006), historical romance about a young woman who goes to live with her father after her mother is killed in a barroom brawl; self-published. Annette Snyder, Whiskey Shots (2007), two romantic short stories set in the Old West; self-published; available in ebook format only. Anna Solomon, The Little Bride (2011), about a sixteen-year-old Jewish mail-order bride who is disappointed to find her husband is forty and lives in a sod hut in South Dakota, and who becomes attracted to her nineteen-year-old stepson. Wallace Stegner, Angle of Repose (1971), a retired historian, bitter about his failed marriage, researches the story of his grandparents' hard lives and enduring marriage in late nineteenth century California; won the Pulitzer Price for fiction in 1972. Terese Svoboda, Bohemian Girl (2011), about a twelve-year-old girl whose father sells her to a Pawnee as a slave in 1861 and whose travels after she escapes bring her into contact with a peddler, a singer, a balloonist and other unusual characters of the Old West. Jack Todd, Sun Going Down (2008), a family saga about a couple who meet during the Civil War and four generations of their family in the American West; #1 in the Paint Family series..
Jack Todd, Come Again No More (2010), about a ranching family whose fortunes are threatened by the Great Depression; #2 in the Paint Family series. Jack Todd, Rain Falls Like Mercy (2011), about a young sheriff, the married woman he falls in love with, and a murder investigation disrupted when the U.S. enters World War II after the Pearl Harbor attack; #3 in the Paint Family series. Nancy Turner, These is My Words (1998), about a pioneer woman in the Arizona territory. Ralpn P. Vander Heide and Judith H. Vander Heide, Chris and Louisa (2012), about a woman in the 1960s and her Mormon ancestors from the nineteenth-century into her own time; self-published. Alissa York, Effigy (2008), a literary novel about a Utah Mormon's teenaged fourth wife who has unusual skill in taxidermy and begins to have distressingly violent dreams as the time of the 1857 Mountain Meadows Massacre approaches. Marsha Ward, The Man from Shenandoah (2002), about a family in Virginia's Shenandoah Valley who trek to Colorado with their neighbors after the Civil War to build a cattle empire; self-published; #1 in the Owen Family series. Marsha Ward, Ride to Raton (2003), about a man estranged from his family who enters a marriage of convenience and undertakes a hazardous wintertime horseback trek with his bride over Raton Pass to Santa Fe; self-published; #2 in the Owen Family series. Marsha Ward, Trail of Storms (2009), about a Virginia family and their flight to the West after an attack on one of the women; self-published; #3 in the Owen Family series. Kaki Warner, Heartbreak Creek (2011), historical romance about a Louisiana belle who becomes a mail order bride to a man in Heartbreak Creek, Colorado; #1 in the Runaway Brides series. Kaki Warner, Colorado Dawn (2012), historical romance about a Scottish viscount who returns from military service to find his wife has run away to Heartbreak Creek, Colorado, and follows to try to persuade her to return with him; #2 in the Runaway Brides series. Kaki Warner, Bride of the High Country (2012), historical romance about a woman who flees from her husband after a shocking revelation at their wedding reception and ends up in Heartbreak Creek, Colorado; #3 in the Runaway Brides series. Jessamyn West, The Massacre at Fall Creek (1975), about the trial of five white men for the murder of peaceful Indians in 1824 Indiana. Frank Yerby, Western (1981), about a Civil War veteran in Kansas during its transition to statehood. Jack Adler, A Rage of Duty (2011), about a young California woman and an English agent who fall in love despite their conflicting loyalties in Monterey, California, on the eve of the U.S-Mexican War. Gwen Bristow, Jubilee Trail (1950), about a young woman from New York who marries an adventurous trader and travels to California with him in the years before the Gold Rush. Gwen Bristow, Calico Palace (1970), about the men and women who migrated to California before the Gold Rush and were already there when it began. Emma Donoghue, Frog Music (2014), about a burlesque dancer whose friend Jenny Bonnet is murdered during a heat wave and smallpox epidemic in 1876 San Francisco. Judith Greber, Mendocino (1987), a family saga about a Russian immigrant and his Native American wife in California. Bret Harte, The Luck of Roaring Camp (1870), a collection of short stories about the California Gold Rush; contemporary fiction at the time it was written. Robin Lee Hatcher, Heart of Gold (2012), historical romance about a minister's daughter and a Wells Fargo driver who meet in Grand Coeur, Idaho, during the Civil War years; Christian message. Cecelia Holland, Railroad Schemes (1997), about an orphaned girl and an outlaw determined to stop the railroad from coming to 1870s Los Angeles; #1 in the Railroad Schemes series. Cecelia Holland, Lily Nevada (1999), about a strong-willed woman who makes a new life for herself in Gilded Age San Francisco; #2 in the Railroad Schemes series. Cecelia Holland, The Bear Flag: A Novel of California (1990), about a young woman involved in California’s struggle for independence. Cecelia Holland, Pacific Street (1991), about an escaped slave who gains influence in Gold Rush San Francisco. James D. Houston, Bird of Another Heaven (2007), about a modern talk show host discovering his family roots in Gold Rush California and nineteenth century Hawaii. John Jakes, California Gold (1989), about a real estate tycoon in California in the early 1900s. Catherine Lanigan, Wings of Destiny (1999), a descendant of one of San Francisco's founders unearths the story of her grandfather's greed and corruption. Louis L'Amour, The Californios (1974), about a family of Irish ranchers in Spanish California. Kristen Lynch, Silver (2014), about a schoolteacher who also works as a news reporter in Silver City, Idaho, as tensions rise between two mining companies on the eve of the "Owyhee War." Gary McCarthy, The Gringo Amigo (1991), about the violent times after the Gold Rush. Ralph Milliken, California Dons (1967), about California during the mission days when it was part of Mexico. Elizabeth Buechner Morris, Bitter Passage (2011), about an immigrant from Prussia who accompanies her husband to California in 1848, bringing their children, when he joins the rush for gold; self-published. Sam Sackett, Sweet Betsy from Pike (2009), about a pregnant eighteen-year-old who travels to California during the Gold Rush with her lover, Ike; self-published. Christina Schwarz, The Edge of the Earth (2013), about a woman who becomes a lighthouse keeper with her husband on California's Big Sur coast in 1898. Robert J. Seidman, Moments Captured (2012), about the pioneering San Francisco photographer Edward Muybridge and his romance with the uninhibited dancer Holly Hughes. Robert Lewis Taylor, The Travels of Jaimie McPheeters (1959), a coming-of-age story about a Scottish boy's journey by wagon train to California during the 1849 Gold Rush. Lawrence Thornton, Ghost Woman, about a Native American woman converted to Catholicism who settles in nineteenth century Santa Barbara. Naida West, Eye of the Bear (2001), about California before the Gold Rush. Richard S. Wheeler, Sierra (1996), about the California Gold Rush; 1996 Spur Award winner. Richard S. Wheeler, Anything Goes (2015), about a vaudeville troupe performing in the remote mining towns of Montana and struggling to attract audiences until a mysterious young woman with a beautiful voice joins them. Stewart E. White, Gold (1913), about four men who form a partnership during the Gold Rush; #1 in the California trilogy. Stewart E. White, The Gray Dawn (1915), about four men who form a partnership during the Gold Rush; #2 in the California trilogy. Stewart E. White, The Rose Dawn (1920), about four men who form a partnership during the Gold Rush; #3 in the California trilogy. Frank Yerby, The Treasure of Pleasant Valley (1955), about a man who leaves his family's ruined plantation to join the California gold rush in 1849. Frank Yerby, Devilseed (1984), about a San Francisco prostitute who becomes wealthy during the struggle between Mexicanos and Americans for control of California during the Gold Rush era. Elliott Arnold, The Time of the Gringo (1953), about the last Mexican governor of New Mexico. James Lee Burke, Two for Texas (1982), about two escaped convicts who go to Texas in a bid to stay free by fighting in the Texas Revolution. Will Camp, Blood of Texas (1996), about a Mexican living in San Antonio who joins Sam Houston's army to fight for independence; Will Camp is a pen name of Preston Lewis; 1996 Spur Award winner. Willa Cather, Death Comes For the Archbishop (1927), about two priests trying to establish Roman Catholicism in the New Mexico Territory. Henry Chappell, Silent We Stood (2013), about a secret band of abolitionists after an 1860 fire that burned Dallas, when three slaves were accused of arson and hanged without a trial. Colleen Coble, Blue Moon Promise (2012), historical romance about a young woman who marries a man by proxy and goes to live with him in Wichita, Texas, in the nineteenth century; Christian message. Elizabeth Crook, Promised Lands (1994), about the experiences of two families, one American and one Mexican, in the Texas Revolution. Elizabeth Crook, The Raven's Bride (1991), about Eliza Allen, the wife who left Sam Houston only 11 weeks after their wedding. Randy Lee Eickhoff, Bowie (1998), about Jim Bowie, who died at the Alamo. Jeff Guinn, Glorious (2014), about a man who flees tragedy in St. Louis and moves West to the Arizona Territory. Stephen Harrigan, The Gates of the Alamo (2000), about the siege and fall of the Alamo during the Texas Revolution; 2001 Spur Award winner. Celia Hayes, Adelsverein: The Gathering (2008), about a family who migrated from Germany to Texas in 1847 as part of a plan organized by a group of German nobility; #1 in the Adelsverein trilogy; self-published. Celia Hayes, Adelsverein: The Sowing (2009), about a family of German emigrants in the Texas Hill Country who remain loyal to the Union during the Civil War; #2 in the Adelsverein trilogy; self-published. Celia Hayes, Adelsverein: The Harvesting (2009), about a family of German emigrants in the Texas Hill Country struggling to rebuild their lives after the Civil War; #3 in the Adelsverein trilogy; self-published. Tina Juárez, Call No Man Master (1995), about a young woman of mixed heritage who fights for independence from first Spain and then Mexico. Elmer Kelton, Massacre At Goliad (1965), about two brothers caught in the massacre of Texans at Goliad ordered by the Mexican general Santa Anna; available in a single volume with its sequel After the Bugles as Texas Sunrise. Elmer Kelton, After the Bugles (1967), about two young men who must confront how much they have lost after fighting for Texas independence, one because his home has been destroyed, the other because he is despised for being a Mexican; sequel to Massacre at Goliad; available in a single volume with Massacre at Goliad as Texas Sunrise. Elmer Kelton, The Buckskin Line (1999), about a young man who joins the Texas Rangers in 1861 after his adoptive father is murdered; #1 in the Texas Rangers series. Elmer Kelton, Badger Boy (2001), about a young man who hopes to return to farming after the Texas Rangers are disbanded, but discovers the girl he left behind has married another; #2 in the Texas Rangers series. Elmer Kelton, Way of the Coyote (2001), about a former Texas Ranger struggling to survive as a rancher in the difficult period after the Civil War; #3 in the Texas Rangers series. Elmer Kelton, Ranger's Trail (2002), about a former Texas Ranger who sets out for revenge in 1874 after his fiancée is murdered; #4 in the Texas Rangers series. Elmer Kelton, Texas Vendetta (2004), about a Texas Ranger whose mission to deliver a prisoner is complicated by a violent feud between two families; #5 in the Texas Rangers series. Elmer Kelton, Jericho's Road (2004), about a Texas Ranger on the Texas-Mexico border whose assignment lands him in the middle of a feud between two powerful ranchers on opposite sides of the Rio Grande; #6 in the Texas Rangers series. Elmer Kelton, Ranger's Law (2006), an omnibus edition of Ranger's Trail, Texas Vendetta and Jericho's Road, #4, 5 and 6 in the Texas Rangers series. Elmer Kelton, Hard Trail to Follow (2008), about a former Texas Ranger who leaves his fiancée to track the man he believes killed his friend, a sheriff; #7 in the Texas Rangers series. Elmer Kelton, Other Men's Horses (2009), about a Texas Ranger who goes on the trail of an outlaw admired by the public for having killed a man who was widely hated; #8 in the Texas Rangers series. Elmer Kelton, Sons of Texas (1989), about a young man seeking revenge for his father's murder in Mexican Texas; #1 in the Sons of Texas trilogy. Elmer Kelton, The Raiders (1989), about conflicts between American settlers and Mexicans in Texas before the Revolution; #2 in the Sons of Texas trilogy. Elmer Kelton, The Rebels (1990), about the Texas Revolution; #3 in the Sons of Texas trilogy. Elmer Kelton, The Way of the Coyote (2001), about two former captives of the Comanche who return to Texas after the Civil War, to find themselves battling outlaws, Indians and the Ku Klux Klan; 2002 Spur Award winner. Elmer Kelton, Many a River (2008), about two boys whose parents are killed by Comanches while the family is migrating through West Texas, one boy taken captive and sold to a Comanchero trader, the other rescued by militia men and raised by homesteaders. Kathleen Kent, The Outcasts (2013), about a former prostitute who goes to Texas in the 1870s to make a new life as a schoolteacher, and a Texas policeman on the trail of a dangerous killer. Al and JoAnna Lacy, A Line in the Sand (2007), a family saga about a young man who migrates to Texas with his family in 1835 and joins Jim Bowie in the fight for Texas independence; Christian message; #1 in the Kane Legacy trilogy. Al and JoAnna Lacy, Web of Destiny (2008), a family saga about three brothers who volunteer to fight in a war against Mexico; Christian message; #2 in the Kane Legacy trilogy. Al and JoAnna Lacy, High is the Eagle (2008), a family saga about brothers fighting in a war against Mexico; Christian message; #3 in the Kane Legacy trilogy. Joe R. Lansdale, Deadman’s Road (2013), a collection of supernatural horror stories about an alcoholic preacher who encounters zombies, werewolves, etc., in Texas after the Civil War. Tom Lea, Wonderful Country (1952), about life on the violent Texas-Mexico border during the late nineteenth century. Jeff Long, Empire of Bones (1993), about Sam Houston and the Texas Revolution; 1993 Spur Award Winner. James Michener, The Eagle and the Raven (1990), about Santa Anna and Sam Houston. Suzanne Morris, Galveston (1976), about three women in Galveston, Texas. Kerry Newcomb, The Red Ripper (1999), about a man's quest for vengeance after his brother is murdered following a shipwreck off the coast of Mexico, which leads him to heroic deeds in the Texas Revolution. Sandra Ramos O'Briant, The Sandoval Sisters' Secret of Old Blood (2012), about two young sisters in Santa Fe on the eve of the U.S.-Mexican War, one of whom is forced to marry an older man after her sister flees to Texas to escape the marriage. Tracie Peterson, Taming the Wind (2012), historical romance about a young widow in Texas and the man who once saved her life; Christian message. Conrad Richter, Tacey Cromwell (1942), about a former prostitute and her common-law husband who lose their children to a "respectable" family in an Arizona mining community. Conrad Richter, The Lady (1957), about a woman in nineteenth-century New Mexico during the period of hostility between cattlemen and sheep herders. Lucia St. Clair Robson, Fearless (1995), about Sarah Bowman, who joined the U.S. Army as a laundress during the 1846 war with Mexico and performed heroically under fire. James W. Russell, Escape from Texas (2012), about a slave during the Texas War of Independence. Irene Sandell, River of the Arms of God (2008), about a present-day Texas woman who marries a rancher to escape her father's control, but only finds a new sort of trap, and a nineteenth-century woman who lived in the same area along the Butterfield Stage route. Anna Small, Tame the Wild Wind (2010), historical romance about a city girl who travels to New Mexico Territory in 1868 to claim her father's ranch, and discovers that a stranger already owns it. Margaret Donsbach Tomlinson, "The Texas Wife" (2014), a short story about a German immigrant to Texas in the mid-1800s. Read it at Fabula Argentea. Janice Woods Windle, True Women (1993), a family saga set in Guadalupe County, Texas, from pioneer times through the Civil War and into the twentieth century. Janice Woods Windle, Hill Country (1998), about a woman in the Texas Hill Country; sequel to True Women. Don Worcester, Gone to Texas (1993), about a 17-year-old boy who leaves Tennessee in 1800 to hunt mustangs in Texas and is captured by Spanish soldiers. Norman Zollinger, Riders to Cibola (1978), about a Mexican orphan who crosses the Rio Grande at the beginning of the twentieth century to work on a New Mexico ranch; 1978 Spur Award winner. Norman Zollinger, Corey Lane (1981), about a New Mexico sheriff and a reporter during a time of conflict with the Apaches. Norman Zollinger, Rage in Chupadera (1991), about the son of a New Mexico sheriff who finds that, twenty years later, conflicts with the Apaches are still simmering; sequel to Corey Lane. Sandra Dallas, The Last Midwife (2016), about a midwife in a Colorado mining town in 1880 who is accused of murder when a baby is found dead. Vicki Delany, Gold Digger (2009), about a woman who arrives in the Klondike Territory in 1898 with her twelve-year-old son and her business partner, a former Glasgow street fighter; #1 in the Klondike mystery series. Vicki Delany, Gold Fever (2010), about a dance hall owner in 1898 whose twelve-year-old son saves a native woman from suicide, thereby giving his mother's worst enemy an opportunity to destroy her business;" #2 in the Klondike mystery series. Vicki Delany, Gold Mountain (2012), about a woman who sets out for the Klondike Territory in 1897 with her eleven-year-old son but is kidnapped by a gangster with a map to "Gold Mountain;" #3 in the Klondike mystery series. Steve Hockensmith, Holmes on the Range (2006), about a pair of cowpokes who are fans of the Sherlock Holmes detective stories and decide to try out their deductive skill when they run across a dead body; #3 in the Holmes on the Range mystery series. Steve Hockensmith, On the Wrong Track (2007), about a pair of cowpokes who accept jobs as railroad guards in order to take a rest from riding horses and exercise the detective skills they picked up from reading Sherlock Holmes stories; #3 in the Holmes on the Range mystery series. Steve Hockensmith, The Black Dove (2008), about a pair of cowpokes who land in trouble when they try to become professional detectives in 1893 San Francisco; #3 in the Holmes on the Range mystery series. Steve Hockensmith, The Crack in the Lens (2009), about a pair of former cowpokes who investigate a mystery in the Texas Hill Country in 1893; #4 in the Holmes on the Range mystery series. Steve Hockensmith, World's Greatest Sleuth! (2011), about a pair of former cowpokes who travel to the 1893 World's Columbian Exposition in Chicago and compete for the title of World's Greatest Sleuth; #5 in the Holmes on the Range mystery series. Dan Jorgensen, And the Wind Whispered (2015), about three teens with aspirations to be newspaper reporters who stumble across a body in a cave near Deadwood, South Dakota, in the 1890s. A.L. McWilliams, Eye of the Cat (2000), a mystery novel about an Old West gunman framed for a murder he did not commit. Mardi Oakley Medawar, Death at Rainy Mountain (1996), about a Kiowa healer in 1866 who investigates the murder of a candidate to become the next Kiowa chief; #1 in the Tay-Bodal mystery series. Mardi Oakley Medawar, Witch of the Palo Duro (1997), about a Kiowa healer in the late 1860s who investigates a murder while his tribe is at its winter grounds in the Palo Duro Canyon in northwestern Texas; #2 in the Tay-Bodal mystery series. Mardi Oakley Medawar, Murder at Medicine Lodge (1999), about a Kiowa healer who must find the real killer after the Kiowa representative at a peace conference in Medicine Lodge, Oklahoma, is accused of murdering a bugler with the U.S. Army; #3 in the Tay-Bodal mystery series. Mardi Oakley Medawar, The Ft. Larned Incident (2000), about a Kiowa healer who investigates a murder that threatens to cause war among the Kiowa; #4 in the Tay-Bodal mystery series. Sharan Newman, The Shanghai Tunnel (2008), a new widow in 1868 Portland, Oregon, discovers her husband had been involved in unsavory activities. Ann Parker, Silver Lies (2003), about a woman who co-owns a saloon with a free black man in a Colorado silver mining town who must find out what happened when a friend's corpse is discovered behind their saloon; #1 in the Silver Rush mystery series. Ann Parker, Iron Ties (2006), about a woman saloon co-owner in a Colorado silver mining town who investigates after a photographer friend witnesses a shooting on the line of the railroad being built to the town; #2 in the Silver Rush mystery series. Ann Parker, Leaden Skies (2009), about a woman saloon co-owner in a Colorado silver mining town who investigates after former President Grant's 1880 visit to the town sparks a crime wave; #3 in the Silver Rush mystery series. Ann Parker, Mercury’s Rise (2011), about a woman saloon co-owner who investigates the death of an East Coast businessman during a stagecoach journey; #4 in the Silver Rush mystery series. Shirley Tallman, Murder on Nob Hill (2004), about a San Francisco woman who has long dreamed of becoming a lawyer and whose first case, in 1880, is a woman accused of murder whose innocence she may not be able to prove; #1 in the Sarah Woolson mystery series. Shirley Tallman, The Russian Hill Murders (2005), about a woman lawyer in San Francisco who thinks a wealthy entrepreneur's wife did not die of natural causes; #2 in the Sarah Woolson mystery series. Shirley Tallman, The Cliff House Strangler (2007), about a woman lawyer in San Francisco who encounters a dead body when she attends a seance; #3 in the Sarah Woolson mystery series. Shirley Tallman, Scandal on Rincon Hill (2010), about a woman lawyer in San Francisco trying to solve a murder case with connections to high-end brothels, an Anglican church, and Darwin's theory of evolution; #4 in the Sarah Woolson mystery series. Shirley Tallman, Death on Telegraph Hill (2012), about a woman lawyer whose search for the person who shot and wounded her brother leads to the discovery of a murder case; #5 in the Sarah Woolson mystery series.